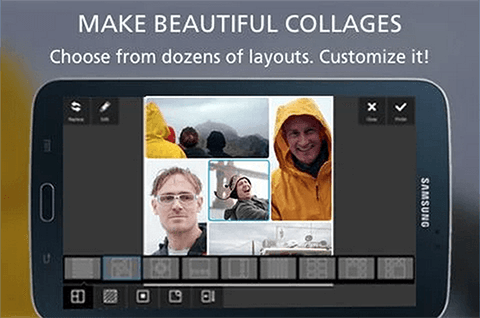 Pixlr is a photo editor app for Android platforms, from the developers of AutoCAD. Performance and task wise, the app falls in the lightweight and basic photo editing app. However, the features we have reviewed were pretty top notch. Even though they performed some most basic tasks, the output was magnificent. No noise was added to the photos, we couldn’t notice any grain on the photo surface caused by the editing, no stretch marks appeared, no pixilation happened – practically, Pixlr overcame all the drawbacks an Android photo editing app usually has. We loved how Pixlr can more powerfully put a grip on every sort of photos and enhance their looks even more applying few preset filters, with the option to adjust them even further. Under this section, the app contains all the basic photo manipulation tools. Tools like brightness, exposure, contrast, sharpness, crop and rotate, fixing the colors, fade and whiten and many more. Many of these settings are accompanied by their own settings, so you can fine tune any settings closer to core level. Focal blur and similar features are mostly popular with social media savvy users. Since most smartphone cameras still can’t achieve a manually adjustable range of aperture yet, the background and foreground focus doesn’t always come out as expected. Hence, the focal blur helps achieve the desired output. Photo enthusiasts these days entirely rely on their smartphones to capture, re-touch and edit their photos for uploading on social networks and photo sharing sites. The camera finder of Flickr and similar other tools reflect how the photography trend is now leaning towards smartphones. These are the preset effects given with the Pixlr app. In numbers, they count somewhat around 100. Shutterbugs would know how significantly a filter can enhance a photo’s final look! These effects in Pixlr come with additional adjustment settings as well. Double tapping a filter shows the intensity control bar. After a filter has been applied, adjustments could be made as well. When edits don’t look stunning enough, overlays can help. Lens flares, smoke, circular vignettes etc. Effects can surely make the photo have a better look. The app is free and available on Google Play Store. An all-rounder for editing photos; however it takes a higher configured phone for smooth editing.